The University of Sheffield The Sheffield Institute for International Development. This blog was originally published in March 2016 by Mark Waddingon, CEO of Hope and Homes for Children, an NGO working to support the estimated 8 million children living in institutions across the globe. Hope and Homes is committed to working with governments to close their institutions through a process called Deinstitutionalisation (DI) by enabling children to return home to their families or into alternative, family-based services. Through a series of three blogs, Mark challenges some of the widely held views on poverty, childhood and the role of aid in addressing child poverty. In this blog, the second in the series, he questions some of our assumptions about ‘childhood’. We will re-blog his final installment when it is published in April. I am always uncomfortable when we construct definitions to facilitate our own understanding of the experiences that are lived by others, and then impose those definitions on them. This is often the case in terms of how we treat our understanding of childhood, and especially as it relates to children and young people who are living with the consequences of poverty. The assumptions we make about childhood, and the subsequent way in which we define it, can undermine the abilities of children to safely take decisions that will enhance their own protection and their own development. For example, for many children and young people living with the consequences of poverty, their age is calibrated by being able to fetch water or cook – marking their functional age – not the number of years they have collected. Ginny Morrow, the Deputy Director of the Young Lives Project at Oxford University, told me a fascinating fact, that in some locations of Ethiopia, although you can start school at the age of seven, in practice, many children don’t start school until they can reach their right arm over the top of their head and touch their left ear. That is, when they are tall enough. Physical age. Although the numeric age of a child is a very important factor, we can easily become fixated with it in a way that can be unhelpful in different social and economic contexts. Indeed, the fixation on numeric age could undermine the cohesion of some child headed households, where a numerically younger child might otherwise be the head because of a function of relationships (relational age), gender or ability to influence others. Functional age, physical age, relational age and so on are ignored by the majority of published findings on childhood, which lock onto numerical age, especially onto children between the ages of ten and twelve, thereby creating a sociology of this group that might be over applied across all childhood age ranges. Childhood is diverse and is experienced differently by children everywhere. It is experienced not only by age – however it is defined – but as importantly along the lines of gender, ethnicity, and disability. And childhood is dynamic. Children and young people move from one location to another, between various forms of family and kinship care, are subject to different cultural and economic influences at different times, and ultimately “age-out”. A further common assumption made by many development agencies – and all too often in the recesses of Development Studies – is that childhood is not only experienced along a supposed continuum of age from infant through adolescence to youth, but through markers of helplessness, vulnerability, and problematic behaviour (especially in adolescence). When we ascribe such attributes to children and young people, especially within the universally accepted frame of the UN Convention on the Rights of the Child which rightly requires us to provide special care and assistance to children, we are fundamentally framing the case for intervention in their lives. Because when childhood is constructed in this way, the motivation to do things for and to children and young people – and to those who are responsible for caring for them – is almost irresistible. And because we have an interest in the way the case for the funding for our intervention is made we will often seek to reinforce such definitions. For children and young people living with the consequences of poverty, the inadequacy of the definition of poverty to describe their experience of it compounds this problem and gives free rein to development organisations and local authorities to impose their idealised views of what their childhood should be. Worse still, for those children and young people who are too often wrongly characterised by development agencies as poor in and of themselves, the case for intervention is almost entirely constructed without their involvement. This is not only a potential violation of their right (as laid out in the UN CRC) to participate in decisions which affect their lives, but it also raises the question: how can we possibly uphold the best interests of the child if we are not involving children in identifying what those best interests are? This is a significant challenge to the effectiveness of many development interventions. And it is derived in part from a perverse incentive challenging many development agencies as well as researchers: problematising children and characterising them as poor – which are not attributes of children, and which are fundamentally challenged by many children that we work with – provides us with a case to justify the aid funding or research grants we bid for to pay for our efforts to do development to them. It’s a conflict of interest that enables us to justify funding on our terms, not on the terms of the children and young people we exist to serve. The numbers of children and young people benefiting from whichever aid intervention ensues become project outputs, the demanded currency of our transactions with donors. And the cost per child becomes a universal metric by which donors seek to judge value for money. In so doing, we are employing an accounting treatment of children that turns them into commodities. Then all too often, their value as a commodity is stripped from them, with immediate effect, at the age of eighteen. This is all very frustrating, because Childhood Studies and, for far longer, Anthropology, have recognised the critical role played by children and young people themselves in their own development. For example, research demonstrates that many children who work and live on the street maintain links to their families and often provide financial support to them. But it is not uncommon for them to abscond when an NGO or local authority tries to place them back with their family. The reasons for this are complex, but the issue I want to draw out here is agency. Children and young people take decisions in response to the situations they find themselves in and, equally, take decisions which can sometimes shape those situations. And they are not only making decisions for themselves but are able to influence the decisions of others, even take decisions on behalf of others. Some of these decisions will be detrimental to their safety, but some will have a positive impact. Children and young people can be powerful actors in their own lives. No matter how much we might try, we cannot control all aspects of their lives. It is absolutely critical that we understand this. By recognising that children and young people are agents of their own development, protection and survival we are compelled to explore and negotiate decisions made with them as part of any intervention. Children’s and young people’s agency, therefore, become a key concern for us within the context of childhood, and especially as it relates to the many dimensions of child poverty. Because if our understanding of childhood incorporates the potential agency of children and young people, then our attention almost inevitably shifts toward their capabilities as wonderfully human assets to be invested in for social, economic, cultural, environmental and political returns, rather than as a problematised demographic living with multiple deprivations – burdensome because they highlight gaps in justice, equality and levels of development, who demand spending. Childhood is as much an aspiration for those children and young people who are experiencing it, as it is a particular phase or even process of human development. This is important because it reinforces the point I made in the first post of this series about not limiting our thinking to just what we are fighting against, such as various deprivations or low income, and to expand our vision to what we are actually fighting for. As I argued, this is far more relevant to the planning of our support of development, because development is about the future, and children and young people live nearer to the future. In this context, childhood becomes a pathway to that future, rather than an escape route from poverty. Every child will have their own aspirations, and each child will develop those aspirations in circumstances almost unique to them. So we must engage children and young people as individuals if we are to be of any use whatsoever to them in enabling them to achieve their aspirations. This leads us toward a more complex, multidimensional view of childhood that fits far more helpfully with the multidimensional view of poverty. And by engaging children directly to understand how the various dimensions of poverty operate throughout the diverse experiences of their childhood we, as much as they, will have a better understanding of what can be done to help them achieve their aspirations. This will give us a fighting chance of making a more meaningful contribution to wider efforts to eradicate child poverty. Listening to children and young people, and investing in them directly is critical to the success of aid efforts to address child poverty. It will make such initiatives more relevant, and rather than being an imposition or an initiative that is externally controlled it will be more likely to add value to the efforts of children themselves and so have a more significant and sustainable impact. But we must avoid being triumphalist in our claims of being child centred and of our focus on the individual child. Because there are challenges with this approach. Firstly, it does not recognise the intrinsically relational nature of children and how this is a fundamental characteristic of their childhood. 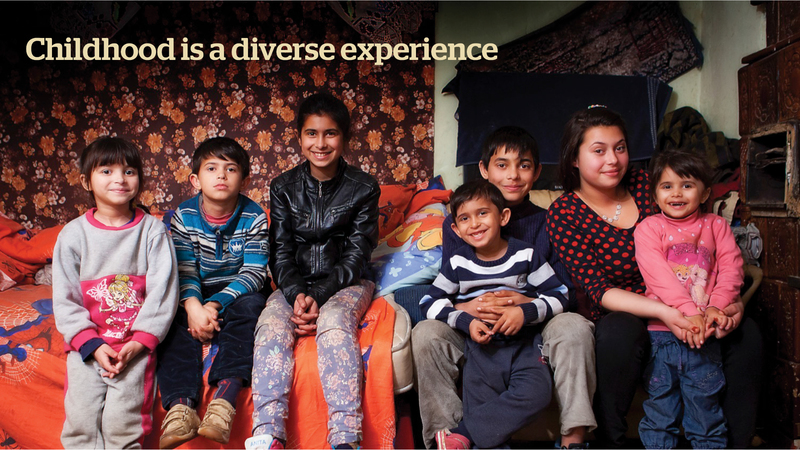 Childhood experiences are shaped by relationships with family, peers and the wider community. Secondly, by focusing on the individual – and even families and communities – we are giving the politicians and policy makers a get-out-of-jail-free card, because it allows them to shift responsibility for change and development back onto individual children and their families, and problematise or even blame them. Thirdly, focusing on individual children, their families and communities places the attention of social workers on the individual circumstances in which children live, and bends and moulds our social work systems and procedures toward those children along with research and the development of new policy and practice. All well and good. BUT! at the end of the day they are going to crash right up against the very structures that exist outside of their influence that are causing the poverty they are experiencing. This means that we need a structural solution. 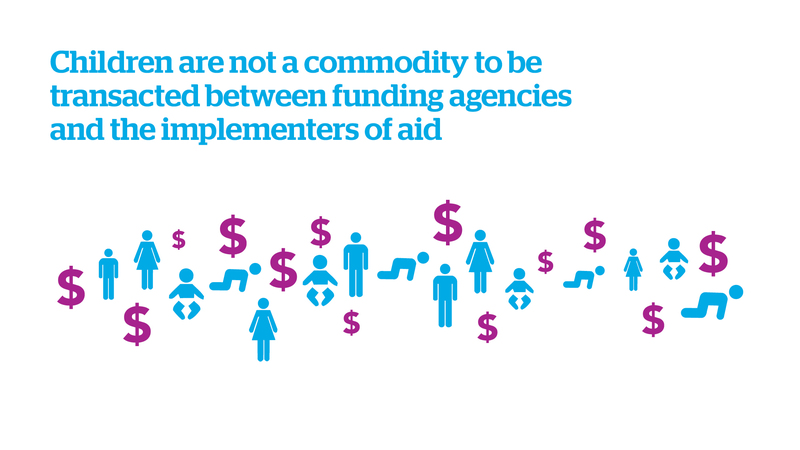 And this is where aid has an important role to play. I’ll pick up on what I call the “Great Derangement”, how we are dangerously out of touch with the reality of aid and what that means for our efforts to address child poverty, in the third post in this series later in March. To find out more about Hope and Homes for Children, please visit their website. Mark Waddington’s blog is here.